Cruising the Eastern Caribbean on Celebrity's Flagship! Celebrity Solstice is the first in the Solstice Class of 122,000 ton luxury cruise ships with four more planned in the series. Solstice was delivered in 2008 with Equinox to be delivered in 2009 and Eclipse in 2010. Two more as yet unnamed ships will be delivered in 2011 and 2012 [Update: the new ships have since been named, Celebrity Silhouette and Celebrity Reflection]. This was our second cruise with Celebrity after 14 years of cruising almost exclusively with Royal Caribbean. Our tastes have obviously changed over the course of fifteen years of cruising. 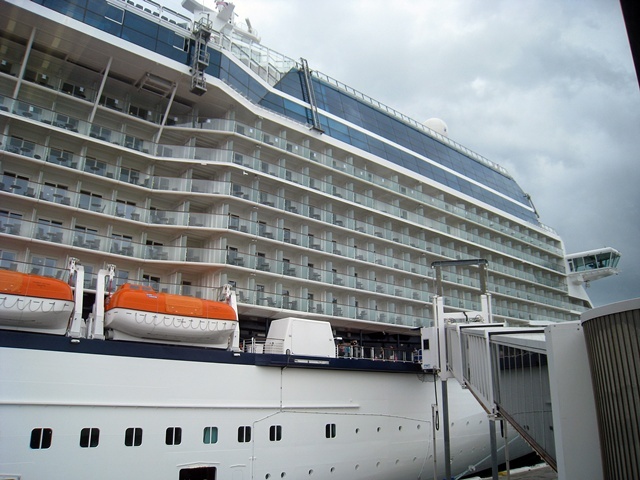 We've gone through the early Carnival cruise phase, and into the inevitable Royal Caribbean stage and now, after a spectacular cruise aboard the Celebrity Solstice, we see the possible beginning of the Celebrity era! (Although, we still will always consider our beloved Royal Caribbean for future cruises as well!) The Solstice class represents the largest ship series in the Celebrity fleet. Presenting Solstice: The last time we sailed with Celebrity was aboard the tiny Horizon way back in 1995. We really don't have any other modern Celebrity experience to use as a comparison. So, in most cases, I'm left to comparing her to Royal Caribbean ships that we've sailed upon. At 122,000 tons, Celebrity Solstice is about halfway in size between RCCL's Jewel of the Seas and Voyager of the Seas. I often thought of her as Jewel on steroids. The ship is hands down, the most modern, most gorgeous ship we've ever cruised on. Her crew is pretty polished for a ship that's still less then six months old. All were extremely friendly and very helpful. I don't think I passed anyone who didn't say "Hello! ", smile, wave, grab trash out of my hand or bend over backwards to help me. The ship is (like all cruise ships) constantly being pampered rather lovingly by it's staff as well. In talking to her crew, everyone I spoke with was very proud of this vessel and serving aboard her... and rightly so. From the moment we were greeted at embarkation with champagne (!) we fell in love with this ship! The Embarkation: was the smoothest of any cruise yet. Although there were over 2500 guests (and visitors) coming aboard, we felt like we were part of a small handful! Arriving at around 11:30am, we immediately moved through security and with no lines in evidence, we were sent to the check-in personnel. Here we got our cards (the same type used by all cruise ships that serves as your cabin key and money aboard ship as well as your personal ID card) in the usual manner, but Celebrity's agent also took our picture to be tied to the card for identification purposes here as well. Usually you have to get your cards, then proceed to another line where they take your picture, then another line to actually go aboard. In Celebrity's system, about 50% (luck of the draw) of guests have their photos taken immediately at check in and the others go on to get their photos in the usual way. This makes getting aboard a much faster process! The Ship: Getting past all this, you climb a steep (might be difficult for some) ramp into the ship and you are greeted with a glass of champagne! Not sure if this is the norm for all Celebrity ships, but it's a feature that I like! Just like on Royal Caribbean, cabins aren't ready till 1pm or so. So you are allowed to roam the ship or go to the Ocean View Cafe (their buffet... what RCCL ships call "the Windjammer") on deck 14. We headed straight up to the Cafe and had a great lunch. Our cruise adventure on this wonderful ship was about to begin! Beautiful views throughout the ship! The Oceanview Cafe: As stated above, this is the Solstice's buffet which serves breakfast, lunch and dinner and late night snacks. We were shocked to discover that the food here was actually the BEST food we'd ever experienced on a cruise ship buffet, hands down. In fact, we decided that if the buffet was this good, the food in the other venues almost didn't matter. I really think that those who have a low opinion of buffets would love the Oceanview's sumptuous offerings. If you have had a better buffet, I should know about it. A great design feature is that the buffet is arranged in stations that you can easily move between with some repetition of selections spread out. You no longer have to stand behind some slow-poke staring at cheese like his life depended on his decision! Everything from carving stations, to salads, to fruit, to vegetables to pizza to BBQ to international or ethnic selections to desserts are all here and all delicious. There are far more offerings than the typical cruise ship buffet. We used to think the RCCL Windjammers were pretty good... but the Oceanview Cafe is excellent. Try to nab a table aft outside on the deck on embarkation day. It's more of a challenge (but not impossible) to get a seat here later in the cruise. Brunch at Grand Epernay... don't miss it! Bistro on Five: The name says it all... there's a $5 cover charge for this pretty little restaurant. Think of it as Celebrity's version of Johnny Rockets, but instead of the lousy JR burgers (I still think Five Guys and McDonald's beats JRs) you get to choose amongst delicious paninis or crepes! Instead of an "oreo" sunday, there's a nice selection of wonderful desserts. This is definitely worth at least one stop during the week. Directly opposite is the Cafe Al Baccio and Gelateria. This place serves coffees and teas and desserts... I didn't actually eat anything at Cafe Al Baccio or the Gelateria, but one of my fellow cruisers loved the offerings. Everything looked wonderful. Murano: The only specialty restaurant on board that we tried. For the $30 cover charge, the food here and attention and ambiance is well worth it. But if I were to compare it to RCCL's Portofino's or Chops Grille, I'd have to say that the latter two are still my favorites. While I would recommend Murano, it would only be for one to experience the ambiance at least once. I ordered the Filet Mignon and Lobster tail; the filet was superb, but the lobster tail was below the quality of that served in the Grand Epernay. All of the other parts of the meal were delicious. Still, I doubt I'd try this one again whereas I will always go to Portofino's or Chops on RCCL ships that have them. This ship also has other specialty restaurants, Tuscan Grille (an italian steak house) which I really wanted to try but it was booked solid for the cruise, Silk Harvest an asian fusion restaurant that we kept saying we'd book but never got around to, and Blu which is reserved for the AquaClass guests (those who sign up for a more healthy and spa cruise experience... think I want to go for this on my next Solstice Class Cruise) I think the main problem with "specialty" restaurants on the Solstice is that the Grand Epernay is an excellent restaurant in it's own right. The specialty restaurants don't feel that "special" for this reason. Again, I can't speak for the Tuscan Grill or Silk Harvest (or even the Aquaspa exclusive Blu) but Murano's wasn't over-the-top special in the way that a Portofino's or Chops Grille is on a Royal Caribbean ship. Mast Grill: Okay, it's merely a BBQ, right? But it's on the upper level above the Main pool and Solarium and incredibly convenient to both. Finally, a spot to grab a quick bite while lounging about the pool! We grabbed some delicious little beef kabobs and hot dogs and cookies here a few times. Not to be outdone, the Solarium has it's own little AquaSpa Cafe that serves healthy lunches. Had some great stuff here, too. The Solstice Nightclubs and Bars and Casino: All of Solstice's bars are state of the art and all are absolutely beautiful! Whether inside or outside, pool side or casino side or just at the back of the ship, they are all glorious! My special favorite was the Martini Bar with it's frosty top to keep your drinks chilly cold. There are three entertaining bartenders here. My favorite was Rosa who puts on quite a show! Watch as he produces six different martinis from six shakers all at the same time. I was so impressed, I made a video. The Casino Bar was a work of art as was the Casino itself. It's location directly across from the ship's shops brought a smile to my face. Win big here? Go spend it in the shops! We did very well at Roulette- it's been a long time since that happened on a cruise ship. The Quasar disco was state of the art, but it closed at 1am every night. We found this extremely puzzling considering that often times, that was the exact time people began to filter in from the late night comedy show. Otherwise the sound system and lighting effects were top notch and the DJ was very accommodating to music requests. Sit in one of the big clear suspended globe chairs straight out of the art deco 60s. Great place! At the top of the ship is the amazing Sky Observation Lounge which has incredible sweeping views and a great bar. This is the venue used for welcome back parties and other affairs. Michael's Club has a nice but somewhat lonely bar tucked away at the back. I met a real nice young bartender named Leigh from Northern Ireland (where my forbearers came from) and he happily served me a drink even though the bar there was closing for the night. He also complemented me on my attempt at an Irish accent. (Well, my Grandfather had a true one!) My buddy Steve and I attended a wonderful Wine Tasting event ($20 admission but well worth it) at the Cellar Masters bar one afternoon. I finally got to confirm my suspicion that I'm strictly a sweet (not dry) wines kind of guy... and a white wine guy at that. Most professional wine aficionados blanch at the idea of sweet wines, but I definitely like Zinfandels, or Riesling Spatlese wines (the latter tasting like apple juice). This tasting saved me a bundle over what began as a buy and try approach before the cruise. There's also a wine and food pairing event, but I missed this. Something to try next Celebrity cruise! Martini Bar... quiet during the day, hopping at night! Quasar Disco... excellent nightclub. But it needs to stay open later. The Solstice Pools and Solarium: Incredible. Simply incredible. I've never thought of any ship pool area as particularly luxurious before this (although the Jewel of the Sea's Solarium came close)! Unlike those on RCCL ships, the main pool chairs are cushioned! There are ample towels pool side that never seem to run out! The Pool area has two pools one deep and one shallow and four hot tubs and a fun and mesmerizing "Wet Zone" which is a series of little fountains which spend the day and night putting on little dancing water shows. Kids love running through this, as did a few adults. The light show in the fountain at night is real cool. In addition to the cushioned loungers are about a dozen sail enclosed (like a tent) beds to lay on! These, like everything else in the pool area, are first come first serve. Diane and I nabbed one around 10am and spent most of the morning and into the afternoon there on the first day at sea. Cushioned chairs abound around the main pool as well. There's an excellent pool bar here (as on all cruise ships) and plenty of pool side servers that are not as pushy as those on some other cruises I've been on. Another wonderful thing about the main pool area is that there are plenty of shaded areas. Those concerned about skin cancer can have a worry free day at Solstice's main pool or the Solarium. There's a lot of hubbub around the pool area by day, but it's not overwhelmingly noisy. The music rotates through different genres as the day progresses. All of the decks are smooth wood rather than astro-turf or some sort of plastic. Everything is constantly being cleaned... you can tell that they want to keep this new ship in new condition. Main Pool Area... Note "A" frame sail tents under shades where we spent the day. The Solarium (adults only) is an exquisite spot, and our favorite. Pictures don't do it justice. It's entirely enclosed (something missing on Solariums on Voyager and Freedom class ships in RCCL's fleet) and it's roof is tiled artistically in solar power arrays. Not only do these provide clean and free power to Solstice, they also cut down the solar exposure in here. (There are actually many other topside areas about the ship with hidden and not so hidden solar arrays. Bravo, Celebrity!) There's a beautiful waterfall here with changing light panels (particularly striking at night!) and again, a water fountain with hypnotizing displays of water arcs that are creatively lit to make it look like light is suspended in them. I videoed this spot as well. Like the main pool, the loungers are all cushioned here as well and again there's an assortment of cushioned chairs about. One of our favorite spots were the Globe shaped loungers which are cushioned and have multiple pillows that are comfortably large enough for two. These are situated with commanding views to port and starboard. We spent embarkation day and part of a day at sea in one of these just watching the port and ocean go by. You would think there'd be a line of people clamoring for these, but there was usually one open at any point during the day even on the busiest pool days (generally at sea). This is a definite must do with your favorite someone. Again, the Solarium has ample shady spots for those who don't like lots of solar exposure. There are no bars in the Solarium, but there are servers again and the Mast Bar is just a short walk away. Again, there are plentiful pool side towels which does away with RCCL's tedious dragging the towels back and forth from the cabin or the insulting need to sign them in and out at poolside. (Note- as of this writing, RCCL has announced that it will institute pool side towels ala Celebrity starting July 1st 2009. Hooray!) The Solarium is a quiet place for optimum relaxation. The music is subtle... like you would expect in a massage therapy room. Solarium Pool... note Solar Cell Tiles on roof! At night, the Main Pool is used at least once for a poolside party with the band or bands or DJ and there's a really great use of colored lighting with many hues. We truly loved the Solarium (our favorite spot) and the Main Pools on Solstice. Our Favorite Seats in the Solarium... save me a globe! Unique to Solstice: Without question, the Lawn Club, and the Corning Glass Blowing Show. Now, I have to say that going aboard this ship, I had no intention of going to a Glass Blowing Show. The idea seemed out of place to me on a cruise ship. But oddly enough, it was a fascinating show! It's only about a half hour to hour long (update: I've been told the show can run two hours; it's possible the one we saw was a shorter one), and in that time I watched a small lump of glass evolve into a large bowl! Evolve is the right word here; there's no way I would have guessed the end result. I'd definitely recommend this show at least once during the cruise. It's very entertaining with one or two people creating the glass object while a third narrates what's going on. This show isn't the least bit boring... and remember, I had no intention of going to it! Corning Glass Show on Solstice! Now, my feelings about the Lawn Club were about the same as the Glass Blowing Show. I've never had a desire to walk barefoot on a lawn at sea. In fact, I almost never do this on purpose even on my own lawn at home. I've also been somewhat doubtful about whether a lawn could survive the salt air at sea. Lawns are notoriously finicky, and indeed, the lawn was being renewed with new sod in some locations during our week. When I went up there, it was nice to smell a lawn but then I thought, why not some flower boxes? My first impression was large wasted space at the top of the ship... until later in the week when I did see families actually playing on the lawn. Croquet, Bocce Ball, and some light golfing were being enjoyed up there. So, while I don't have a desire to do this, it's obvious that some people love this area. Some have suggested that this area would be better served with more lounge chairs and maybe a hot tub or two, but since we never had trouble finding a spot pool side or in the Solarium, I don't think it's necessary to get rid of this feature. Again, my main concern here is Celebrity's ability to keep the lawn alive up there... if it's constantly in need of replacement sod, it's probably a better idea to just astro-turf the whole lawn club and be done with it. The Cabin Experience: Our cabin, 8315, was a balcony cabin located aft of the bump-out (with the enormous Celebrity "X" on the side) about midway to the back of the ship from the bump-out. It's a category 2A Deluxe Ocean View Stateroom with a Veranda. Measurements according to the brochure are 194 sq ft with the veranda being 54 sq ft. This is somewhat larger than the equivalent on RCCL ships. The first thing you notice upon finding your cabin is the door to the room... it's in it's own private alcove. The doors have peep holes (with covers on the inside)... a great touch. Our cabin door opened out into the hall, something we had to adjust to as every cruise we'd been on up till this time had doors that opened inward. (Note, this isn't always the case on Solstice. Some open inward) Advancing in, you see a plethora of light controls for the cabin including a dimmer switch! There's also a master on/off switch here... fun to tap when someone's in the bathroom. Speaking of the bathroom, yes it's much roomier than any others we've experienced in a cabin of this type. There's plenty of storage for toiletries here, and Celebrity actually provides things worth using. I can't remember ever seeing cotton balls and Q-tips as amenities in any cruise ship before. Towels and hand towels are in a nice spot convenient to the shower and wash clothes are rolled up on the bathroom counter top. The trash can is built into the cabinet beneath the counter where bathroom trash can be hidden away. Nice touch! The girls raved about the low rail inside the shower stall for leg shaving. The shower head itself can be swivel adjusted for a rain spray or a power spray, but oddly it's not adjustable in height. It can be pointed in any direction though. The shower temp is in centigrade; it's middle setting is comfortable. The sink is the above the counter "bowl" type which people seem to love, I guess for the height. It looks nice, but other than that, I don't get them. (I'm a guy... it's probably a girl thing) When the lights are turned off in the bathroom, they actually just go into a nightlight mode. A great idea! The beds and linens are superior and extremely comfortable and very smart looking (I'm in the biz, I know what I'm talking about). Mounted against the headboard are small lights for reading. One of these lights has an additional switch that allows you to shut down all of the cabin lights from bed. This is a super feature. Above the bed are two excellent storage bins. I'm 5'7" and found them easy to get things into and out of. I used this space to store things I didn't need all the time (for instance, beach towels or additional shorts and sweats). Some have complained that they needed to get on the bed to gain access to these bins, but I never had to do this. The main dresser has the typical drawer space found in RCCL staterooms. They provided more than enough space for underwear, socks, bathing suits, etc. All of the rest of our clothes fit in the roomy closet. The main dresser is marble topped and descends down to a makeup table for the ladies. The main dresser is where you'll find the mini fridge (stocked with purchasable items) and above that is storage for the interactive TV's keyboard. The interactive TV is a 32" flatscreen with easy to use menus and fast response times. Here you can watch TV, order room service or port excursions or listen to music channels or see your photos taken aboard ship or in port by the staff. How do the pictures get to your TV screen? They use facial recognition software that identifies you, then shuttles your pictures to you! This had some bugs at first with not all your pictures getting up there, but of course they still also post prints the old fashioned way in the ship's photo shop. By mid week though, all our pictures were automatically showing up on screen. There's a cool rolodex like feature that allows you to spin through them and zoom in on them. Of course, you can purchase them from here as well. Beneath the bed is even more storage. We fit our two 29" Samsonite suitcases under there, along with two 21" carryon suitcases and also the cage that the two lifejackets are stored in! That's a lot of storage under there. The couch is white leather-like material and extremely firm. I loved it, but other reviewers have been less kind. I found it very comfortable. The mattress was extremely comfortable... in fact, I missed it and the pillows when I came home. This almost never happens with me, especially with pillows! The closet has slider doors. Inside here is the typical safe for valuables. I want to note here that we often left some valuable equipment out right on the counter and never once was it stolen or moved by those coming into our cabin while we were away, including of course our magnificent cabin steward, Roger! (I'm not advocating that anyone put their cabin staff to the test by leaving out the Hope Diamond... but it was nice to know that when we left things out, they were still there when we got back.) Speaking of Roger, he was in the same league as all of the best cabin stewards we've had. It was a pleasure dealing with him. He always made sure the ice bucket was full, and that we had beach towels in port. The rugs and art and overall feel of color is wood and reds and beiges and tans... all soothing color combinations and very tasteful. The cabin's curtains have an inner shear and outer light blocking drape. The sliders they are on overlap rather than meeting in the middle- this means no stray light gets in! Yay!!! The air temperature control is very effective when setting a desired temperature. There's a mirror in the bathroom (most of one wall) and a mirror over the makeup table and a full length mirror on the side of the closet. The veranda was another big step up. Celebrity did away with external lights on the balcony! Some buffoon in the cabin next to us couldn't ruin a night sitting on the balcony looking up at the stars by leaving his "porch" light on! The veranda floor is buffed wood and the furniture is two adjustable reclining chairs with comfortable mesh seats. There's also a normal height table for eating breakfast or any other meal on the veranda... finally no stooping down or balancing your plates on your lap! We ordered breakfast from room service twice for this reason. One note: in this cabin, the view directly down when standing at the guard rail is of the tops of the life boats three decks down. (This would not keep me from taking this cabin again, though.) The view of the ocean from any other angle than this is spectacular though. Our Balcony with it's excellent furniture! The Spa Experience: The workout area features dumb bells, treadmills, reclining bikes, and circuit weight training equipment... all the usual items found in a modern gym. I found the treadmills very intriguing. Each had a multi-purpose screen that could cycle between TV, or goal animations (like a track showing you your laps or a mountain climb) and I think a screen for controlling an I-pod. (I don't have one of these so I can't speak about it.) Don't forget your headphones! The jack on the treadmill will allow you to use all normal earphones or buds with the standard attachments. (Note- some cell phone headphone users might have to use an adapter to attach to this port) The workout area is a bit small for a ship of this size, but it was never crowded. One thing I wasn't too fond of was the fact that all of the treadmills face to starboard rather than forward... I like the idea that I'm walking or jogging over the ocean with the view forward. All during the week there were fee based and free exercise classes and yoga classes and personal training and body evaluation things going on. It seemed more comprehensive than other gyms on ships. As always, the spa includes fee based massage treatments and, as usual, we both indulged! Massages are always higher priced at sea than at home, but so what? You're on a cruise! Indulge! Ours began with a body exfoliation scrub as part of the normal massage... something I've never had on a standard massage. The massage table was heated as well. The only thing I wasn't crazy about was the massage room itself was lit up by windows. I prefer the darkened inner rooms which are more relaxing. Still, the massage was excellent and highly recommended. They use heated Elemis products as used on Royal Caribbean. The Solstice also features something new to us which we never used (but kept planning to try) called the Persian Garden. This is basically a relaxation area for a fee that includes heated tiled beds and aroma therapy steam rooms. For those who just want a sauna, the men's and women's locker rooms have a sauna. The one in the men's locker room was somewhat smallish, but never crowded. The locker room was impeccably clean the two times I used it. None of the lockers were near the ceiling. The showers were always well stocked with shampoo and liquid soaps. Entertainment on Solstice: There are two theaters on the Solstice. The main theater called Solstice Theater is the place for the huge production shows. We attended two of the three shows missing "Pulse" due to us missing the 7pm show for late dinner seating... we misread the activities sheet. We saw the two other magnificent shows, "Ghostlight" - a nice little song and dance show rotating around the closing of a theater and all of the history of shows it's seen, and "Solstice-The Show" - a phenomenal Cirque-like show with some touches even Mystere in Vegas never tried. The man walking down the columns perpendicular to the floor and the dancers floating out actually over the audience rather than just over the stage was mesmerizing. The opera singing and music and acrobatics made this my favorite show. (I love Cirque... but if you hate Cirque shows, don't see this one) We skipped the man playing the Xylophone but heard that many enjoyed this show. We always skip the "Welcome" aboard and "Farewell" shows as we've seen enough of these during our cruise careers. The other theater aboard is the intimate late-night showroom called Celebrity Central. Because it hosts the late-night comedians, we kept calling it Comedy Central. The comic that week, Steve Caouette, was excellent. He plays with the audience and does incredible sound effects to keep everyone in stitches. I went to his show twice. One elderly gentleman who'd been partying a bit too much got up on stage with Mr. Caouette and shook his hand then hugged him, and Mr. Caouette worked him smoothly into the material than graciously got him back down and to his seat without losing his cool. Very well done, Mr. Caouette. (I met the older gentleman, who called himself "Holly" later in the week and he hugged me, too! What a fun character!) One thing I found truly awesome was that the singers in the production shows and even the comic after his show stand at the theater exits after the show and shake hands with the guests as they leave the theater. Again, this was a really nice touch. Our Itinerary: With all the cruises we've been so blessed to be able to do, we've seen many of the same ports over and over again. In fact, some, like St. Martin and St. Thomas and Labadee and Puerto Rico and Nassau almost feel like home. This itinerary was the typical eastern Caribbean route with one exception... a stop at Tortola in the British Virgin Islands (BVI) and an excursion over to the island of Virgin Gorda, BVI to visit the Baths. The excursion starts with a short bus ride over to the port then a 45 minute ferry ride from Tortola over to Virgin Gorda. Once there, an open air bus takes you to the Baths (with a short stop at a lovely beach on the way) The Baths is actually a beach covered in enormous boulders ranging from car sized to large house sized! These are stacked upon and against each other at the water's edge and form complex caves with openings allowing in shafts of light and small pools with fish in them. They open out to secluded beaches which are very nice. There are winding paths which take you back to the shuttle bus parking where you started. If you are relatively healthy, and you really want to see an awesome natural formation, check out the Baths at Virgin Gorda whenever it's offered as an excursion. I recommend water shoes for this excursion. As for the balance of the itinerary, we did what we always do in the other ports: St. Martin, straight to La Playa beach at Orient Bay (say "Hi" to Jerome! ); Labadee, Haiti, staked out some chairs on the beach looking at the Dragon's Breath zipline which Kim and Steve and I did in the afternoon; and at Puerto Rico we stayed on the Solstice and had the ship mostly to ourselves. See our other cruise reviews for more details on the ports besides Tortola covered here. The Improved Debarkation Process: Gone are the multi colored tags with their often confusing hues (light gray, medium gray, dark gray, puce...) and the loud announcements of colors that can leave the ship and the crammed up lines of people blocking the stairwells and elevators and making it a thoroughly unpleasant experience. Now everyone is assigned a group number and a venue to relax in. A representative then comes to your venue and announces the groups that can leave (kind of like the zones called for loading a plane but far more dignified). Diane and I, being Elite members with Celebrity since we're Diamond members with Royal Caribbean, were in a priority disembarkation lounge with other elite members. After enjoying one final and wonderful meal in the Ocean View Cafe, we headed over to the priority venue and sat for about ten minutes before our group was given permission to go ashore. I fully expected, ala every other cruise ship I've ever departed, to stand in an infinitely long and unmoving line. Imagine our shock when we moved across an empty deck five and right down the ramp to the port without any lines whatsoever! We came down the escalator and there was our luggage waiting for us and we breezed through customs where again, the lines were too short to even notice. In no time we were outside of the port building and into a cab for the five minute or so ride to the airport. (It's regrettable that Delta had to muck up the rest of the morning and afternoon by sending us all over the terminals to find someone to check us in due to their staff's incompetence. Things didn't go well for the rest of the day with Delta either... but I'm not here to review Delta. Suffice it to say, Delta isn't "ready when you are" anymore.) I've never disembarked a ship in such a smooth and orderly manner before. Royal Caribbean has just announced that they too will begin a similar program in July. Thank goodness! One other thing, you can elect to keep your luggage in your cabin the last night and carry it off yourself as soon as possible in the morning should you really be in a rush to get an earlier flight. The crew cannot offer assistance with getting your luggage off the ship, but if you have no problems doing this yourself, it saves you a step in the disembarkation process. 1) Keep at least one pool and one hot tub open 24/7. (Preferably in the Solarium) This is common practice aboard all of the Royal Caribbean ships. It only makes sense for people who want to enjoy these locations after a night of shows and drinks. The pools aboard Solstice are the most breath taking I've ever seen and have gorgeous lighting at night. Why close it all up? 2) Keep the Quasar disco open till at least 3am... closing it at 1am every night is just plain stupid. Many nights, people would start rolling in around 12:45am after the comedy show only to find the venue making last call announcements. Even the bartenders seemed unhappy at the loss of revenue when the Quasar shut down so early every night. The hours of operation list the Quasar as staying open till "late". This usually means till everyone leaves. 3) Better perks for Captain's Club members. This is something that Royal Caribbean wins hands down over its sister line, Celebrity. Celebrity needs to institute the popular coupon books found on Royal Caribbean for its Crown and Anchor Society members. The coupon sheet they do supply isn't as exciting... and some of the ship's staff in the Spa didn't know exactly how to use the coupons designed for the spa (although they graciously accepted them anyway). 4) Keep the production shows in sync with dining times as an "after dinner" show. In other words, if you have Main Seating for dinner, the production show should run after dinner and those with Late Seating for dinner should have their show after dinner as well. People take a late dinner because they want a longer day enjoying the ship. They don't want to go to a show then have dinner. It kills the whole point of a late night seating. I will say that Celebrity seemed more in sync than Royal Caribbean... but I don't know why they can't both stick to making shows "after dinner" events all the time. Why Celebrity Solstice should be your next cruise choice: Because it's a spectacular ship! We thought it was the most gorgeous ship we ever sailed on... and even the most jaded cynics agree on this point. We are very excited that Celebrity has four more ships coming out in the Solstice Class and we hope to be lucky enough to sail on all of them. We're also looking forward now, after sailing the flagship of the Celebrity fleet and adoring it, to sailing on some of the older gals of the fleet... especially the much ballyhooed Millennium Class ships (slightly smaller than the Solstice class). Her officers and crew were all bubbly and effusive and attentive to every need. I didn't encounter one rude or sullen crew member (not that I look for this sort of thing with an eagle eye as some do.) I wish this could always be said for some of the guests, but all in all, the vast majority of guests were equally excited about the cruise, and gracious and fun loving people. The Cruise Director, Dru, was very informative and pretty funny without being over the top. Food was always top shelf or even over the top delicious! The shows were excellent. The midnight dessert buffet one night was decadent in the extreme! Hey, no smoking in the casino... yay! Celebrity Solstice is a cruise of relaxation and luxurious pampering. To compare Celebrity to Royal Caribbean is to compare apples and oranges. The Celebrity Solstice guest will notice activities that are much more subdued than the pool side line dancing and belly flop and hairy legs contests on other lines. Gone are the constant and overbearing (or at least, I didn't notice them too much) announcements over the PA for Bingo and Art Auctions and Blackjack Tournaments that can kill an otherwise peaceful day of watching the ocean go by from the perfect lounger (to be sure, most of these activities can be found on Solstice, and are announced... just not with the insane fever pitch of other lines). You won't find towel animals on your bed at night... and I say, fine. I never missed them. Celebrity Solstice is geared to a more mature (but not overly senior) audience than Royal Caribbean with the age group being more along the lines of mid 30s and up. We'll continue to go back to Royal Caribbean from time to time (Oasis next year if all goes according to plan! ), but Diane and I found Celebrity Solstice to be a more perfect fit for who we are today. We look forward to sailing with them again as soon as possible. Celebrity Solstice docked in St. Martin at sunset.